The 2018 Tour got underway today. CHRIS FROOME’S BID for a record-equalling fifth Tour de France title got off to a shaky start Saturday after a dramatic crash left him around 50 seconds down on rivals, Fernando Gaviria claiming the yellow jersey after a bunch sprint rounded off the first stage. With just 6km to the finish, Froome went flying over a barrier and landed on a grassy verge, emerging seemingly unhurt as the peloton sped off to a frenetic sprint where Quick Step’s Gaviria edged Peter Sagan and Marcel Kittel. 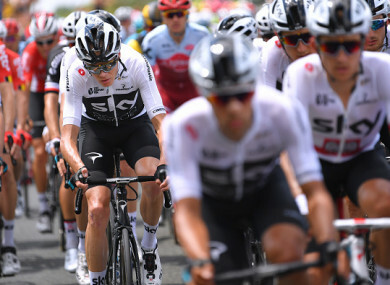 Froome, fellow Briton Adam Yates, Colombian Nairo Quintana and Australian Richie Porte, all pre-Tour favourites, all lost valuable seconds having been caught in a series of falls and flat tyres over the final 10km of the 201km first stage. Former Sky man Mikel Landa, 2014 champion Vincenzo Nibali and 2017 Giro champion Tom Dumoulin conversely, all finished in the main bunch having gained an unexpected early advantage over their key rivals that blows the Tour wide open. Gaviria was left thrilled after his impressive stage win on his very first Tour de France, after outlasting world champion Sagan in a long struggle down an 800m home straight with Kittel, who won four stages on the 2017 Tour, leaving his bid too late and coming third. “I just said to myself ‘go’ and had the legs luckily,” Gaviria said. “What an amazing day, nobody is happier than me. Former green jersey winner Thor Hushovd, here working for Norwegian television, told AFP that Kittel and Dylan Groenewgen were the key sprinters to watch out for this year. On a sunny Saturday early in the school holidays, enormous crowds of fans packed the holiday towns along the Atlantic coast in a highly festive atmosphere where any expected fall out from the Froome booing on Thursday was muted. Email “Froome's Tour off to a shaky start as Team Sky rider suffers dramatic crash ”. Feedback on “Froome's Tour off to a shaky start as Team Sky rider suffers dramatic crash ”.